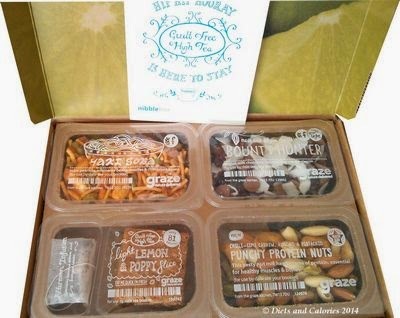 Graze are expanding their product lines in all sorts of directions, one of which is their ‘Afternoon Tea’ range. 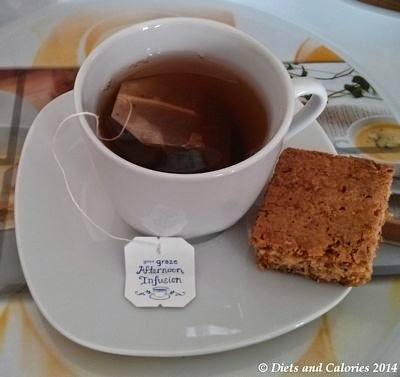 This line includes a slice of cake together with a tea bag infusion. At the time of writing the selection includes: Banana Cake (55 calories), Carrot Cake (82 calories), Lemon and Poppy Cake (81 calories) or Love Cake: limited edition (106 calories). I’d been hoping for one of these cakes to show up in a Graze box soon, and this week, there it was. The Lemon and Poppy Cake with an afternoon infusion. Afternoon tea is one of those English traditions that almost seems to belong to another age now. It conjures up images of delicate china cups, cucumber sandwiches, scones and cake. At least that's how I've seen it on TV! I can't say I'd normally be tempted by afternoon tea as I try and stay away from calorific dishes like cake. But this was different. 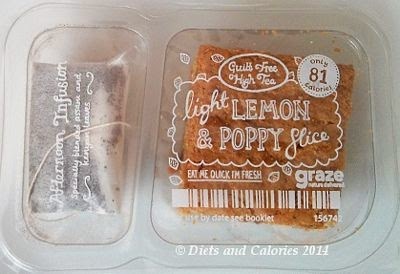 The Graze cake has only 81 calories, which could easily fit into any normal eating plan. I loved the idea of the tea bag too. Although I detest Earl Grey tea and only ever drink PG Tips, this tea infusion sounded intriguing. The ingredients are Assam, Kenyan and Earl Grey tea leaves. So I prepared my little tea break, complete with cup and saucer, how civilised! The cake itself has a gorgeous lemony taste and is perfectly soft to the touch. The crunchiness of the poppy seeds give a nice contrast but their taste doesn't overpower the lemon at all. And the tea, which I anticipated with some trepidation, was lovely. It’s a bit fragrant but it goes perfectly with the cake. This is a real winner, all for just 81 calories (plus any milk you put in your tea)! This gets a rating of LOVE. Please send some more soon. Contains eggs, gluten and wheat.